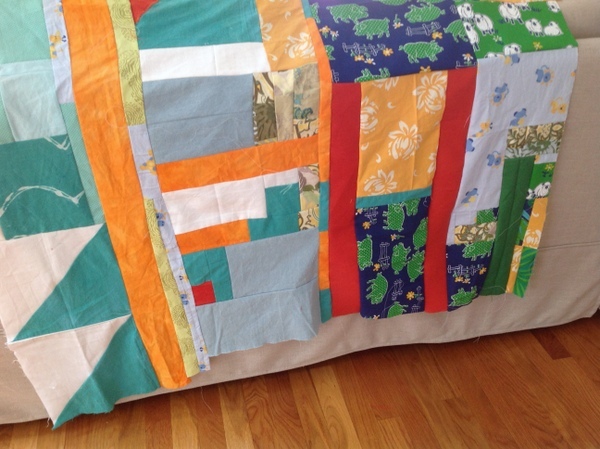 Here’s just a little peek at the quilt I’ve been working on for lo these many months. The quilt top is basically finished now, so I’m working on the back and making plans for quilting it. It’s made up of my husband’s dress shirts that were on their way to Goodwill. Hope I can show you more soon. 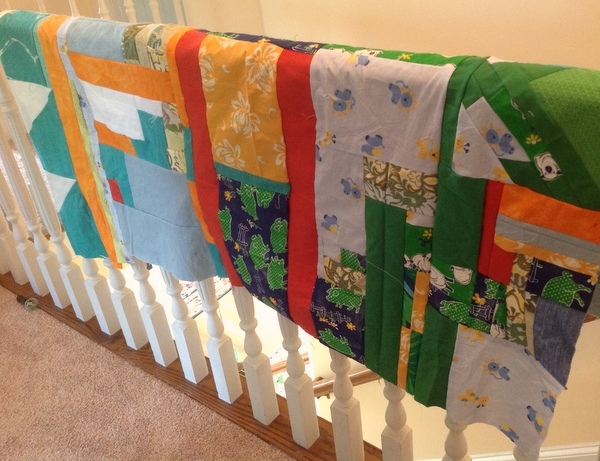 Here is an earlier post about it, and if you want to see more patchwork projects, click here. 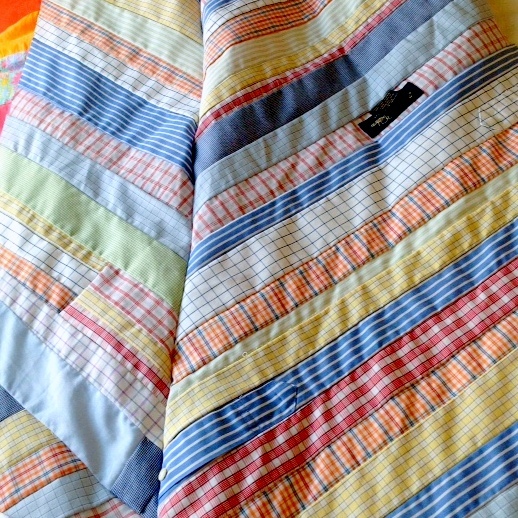 I just realized I haven’t even blogged about another quilt I’m making. I’ll have to remedy that. Hope you’re having a good Monday. American friends in the Northeast: stay warm and safe! I actually have three patchwork projects going now. Yes, three. Yes, I have a problem. Hopefully more about the others soon. But this one started in the most irresistible way. I was making a bed cover for my daughter (10) when my son (7) declared he wanted a quilt, too. I told him he could look at some of my quilting books for inspiration, and he sat down and thumbed through them. He liked the Gee’s Bend book the best (is this kid good at getting brownie points or what? 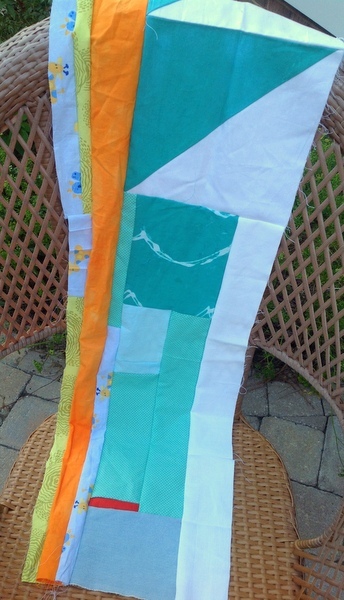 Gee’s Bend is my inspiration for all things quilty). Then he set about arranging my scraps into patterns. It’s been so fun to see what he comes up with. He’s very particular. 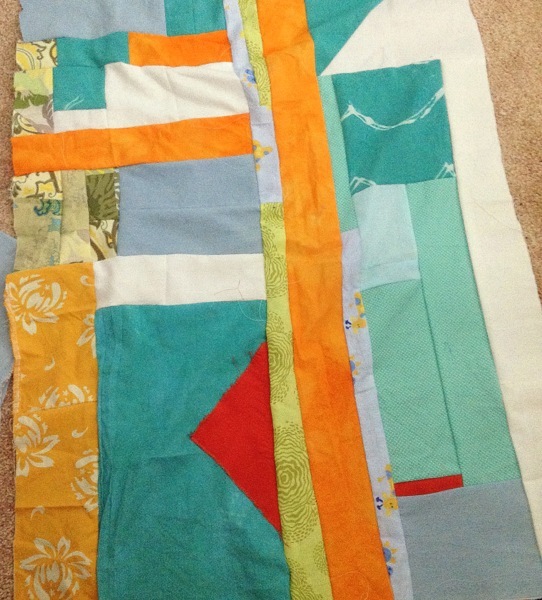 Also fun to see what surprises come together as the patchwork grows. The way the deep orange pops, the way the blues and greens begin to blend together, the way the prints dance and change character according to their placement and size. 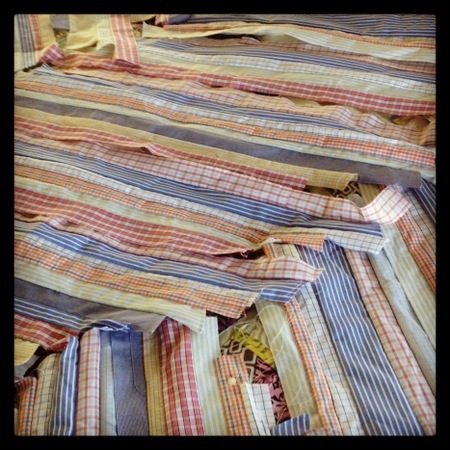 All of these fabrics have a story. They’re bits from friends and family or pieces of other projects, some reeeeeally old. He seems to want it to be a lap quilt. For more of my patchwork projects, click here. Finished Call the Midwife (the book). It was very good. I especially love the stories about the nuns. Fascinating people. Happy New Year! Did you survive the holidays? Ours started out low key and then sped up after Christmas with the Colorado wedding of a dear friend, a couple of days of skiing, and 3 stitches in my lower lip after a minor fall. I’m finding, unexpectedly, that I kind of love January. Not for the weather. Who could love January weather, even in the South? But I love getting back into the routine and not having a bajillion outside actitivities to distract and exhaust me. And the days are getting just a tiny bit longer. So I’m told. 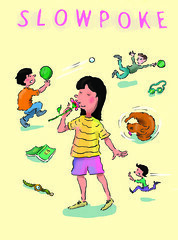 Currently I’m back to work on my nonfiction book for elementary-aged students. I’d taken several weeks away from it while focusing on my novel, and the break has really helped clarify things. It still needs a lot of work, but I’m excited to see how far it’s come since my initial brainstorm. I’ve been getting some feedback on both projects from writer friends, which is so invigorating! The above picture is a sneak peek of a quilt I’m working on. It finally seems to be coming together, though it’s looking like spaghetti to me right now. For more sewing and quilting projects, click here. What about you? What’s inspiring you this month? Reading anything fantastic? Stay warm, folks! My first instinct, when I saw these stains, was to freak. No, I knew it wasn’t blood. But markers are NOT allowed in bedrooms in our house! Especially not in bedrooms furnished with handmade patchworks! Especially not with mystery markers that may not be washable! When I calmed down, I thought about my options. I could try to get the stains out, but with the mystery markers, there’s no telling what would happen. I saw visions of a splotchy pink stain covering half the duvet. I finally decided to cut them out and replace them with appliques. I like the results. 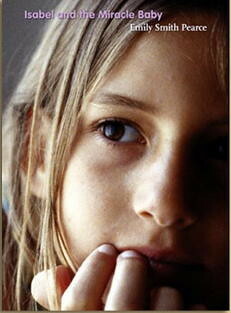 I’ve been interested lately in mending that’s meant to be attractive, not invisible. 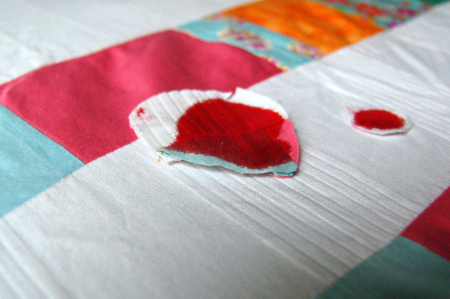 Annekata has done several posts about beautiful mending, like this one. There’s a word in Japanese (wabi sabi) for the imperfect beauty of objects with a history. You’ll get the idea from this wabi sabi Pinterest page. It’s full of the most beautiful mending you’ve ever seen. I love to watch fibers age and weather. 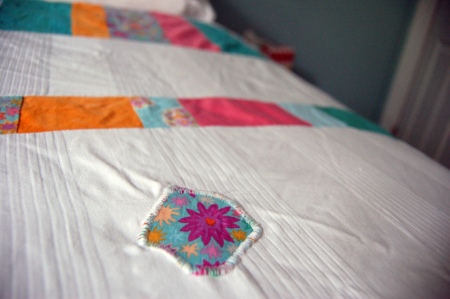 For more of my patchwork projects, including more pics of this one, click here. I’ve been working on a new dress. So far, so good, if I can just master the zipper. Crossing fingers. Still reading Quiet and also This One is Mine by Maria Semple. Looking forward to the Austenland movie next month!